A teenage boy was seriously injured when he fell about 50ft (15m) into a quarry in the early hours. 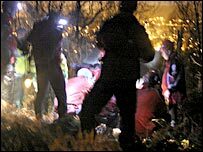 Three rescue teams and a helicopter were called in to move the 15-year-old from the Berw Road area of Pontypridd. Police said they had yet to find out why he was on the mountain at 0300 GMT, although he told rescuers he had stormed out after a family dispute. It is understood the teenager did not have a torch with him, but phoned for help after his fall. He was in a serious but stable at the Royal Glamorgan Hospital, Llantrisant. The teenager was treated at the scene by paramedics before being airlifted in an operation co-ordinated by Central Beacons Mountain Rescue team. The team's Peter Howells said: "He had been knocked about during his fall. "All that we were given was that he had had a family disagreement and he had stormed out of the house. "We don't know which way he was going. The bit he fell down was a disused quarry. He had walked across one of the mountain tracks without a torch. "He made a 999 call on his mobile. It was very good joint effort all round. We called in the helicopter in because it was only four or five minutes flying time to the Royal Glamorgan." The teenager was carried by stretcher over rough terrain to a clearing where the rescue helicopter winched him aboard and flew him to the hospital. Two other search and rescue teams - Western Beacons and Brecon - were called in to help. South Wales Police said: "We are investigating the circumstances of how he came to be near the quarry."